Muffy has worked as a host and talent for various television shows, including ESPN and Resort Sports Network and Trading Spaces. She has been featured in several ads and commercials for companies such as Subaru, REI, Mountain Hardware and The United States Olympic Committee. Muffy also works as a freelance writer and has had articles published in various magazines and online websites. A World Champion disabled ski racer, Muffy has won more than 25 World Cup titles, two Overall World Cup victories and 4 Paralympic Medals. When she was 16, a devastating ski racing accident changed Muffy’s life, but not her motivation to reach her dreams. As an upcoming junior ski racer, it was probable that Muffy would eventually reach her dream and compete in The Olympics until her accident in 1989 left her paralyzed and dependent on a wheelchair for her mobility. But Muffy didn’t let her physical condition keep her from reaching her dream, she relearned to ski, adaptive ski and after much hard work and determination, she was back on the slopes, chasing her dream. In 1998 and 2002, Muffy accomplished her life long dream and ski raced in the Paralympics, the Olympics for people with physical disabilities, winning a total of 4 medals. 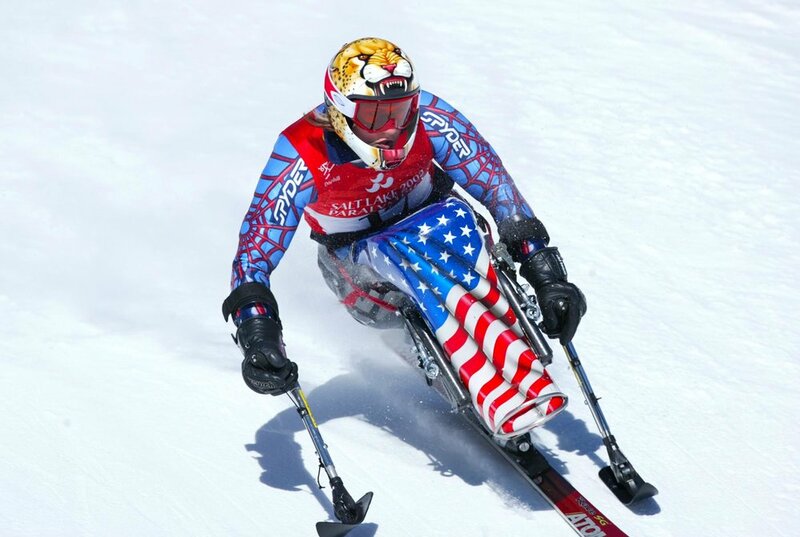 She has been recognized by numerous organizations for her skiing and athletic accomplishments, including the International Olympic Committee, The Paralyzed Veteran’s of America and The Challenged Athletes Foundation. She is currently one of 11 athletes worldwide invited to serve as Ambassadors for the International Paralympic Committee. In April of 2011, Muffy was inducted into the US Ski and SnowBoard Hall of Fame, an immense honor, truly beyond her dreams. And in December of 2012, Disabled Sports USA inducted Muffy into their Ski Hall of Fame. Most recently, Muffy has climbed the top of the podium in summer Paralympic competition winning 3 Gold Medals in the 2012 London Paralympics in handcycling. After just three years of competition, Muffy has become a dominating force in female handcycling, winning every race she entered in 2012. All of this after serious neck surgery in October of 2011 threatened to halt all her future competitive goals. Muffy won back to back World Cup Overall titles, a World Championship and won the most Gold medals of any athlete in the 2012 Paralympic Road Cycling events. She is excited to be going to Rio this year as a member of the US Paralympic Advisory committee and cheer on all her old teammates. Muffy’s National Organizations and memberships include being a past National Board Member of The Make-A-Wish Foundation, a former Board Member of The United States Ski and Snowboard Association and she currently serves as an Ambassador for The International Paralympic Committee and Right to Play, an international humanitarian organization. She is also a member of the International Paralympic Committee's Governing Board. Muffy was an Athlete Representative to the US Olympic Committee’s Athlete’s Advisory Council and currently serves on The International Paralympic Committee’s Women in Sports Committee, the US’s Paralympic Advisory Committee and UCI’s Paracycling Commission. Additionally, she was a founding member and currently serves as an Honorary Board Member of Sun Valley Adaptive Sports. She is a an Alumni Member of Stanford University, The United States Disabled Ski Team and a National Alumni Member of Delta, Delta, Delta Fraternity, who honored her with their Women of Achievement Award in 2006. Furthermore, Muffy is an accomplished adventurer and world traveler. In 2002 she became the first female paraplegic mountaineer to summit a peak over 14,000’ when she successfully climbed California’s Mt. Shasta with three other paraplegics using a device called a SnowPod. Since then, she has successfully climbed Colorado’s Pikes Peak two times in her wheelchair. She is active in many sports including: mt. biking, river rafting, waterskiing, scuba diving, swimming, weight training, horseback riding and handcycling. In 2005 and 2006, Muffy and her husband, Jeff Burley, spent 9 months traveling the globe volunteering with non-profit organizations in developing countries helping teach sports and recreation to people with disabilities, proving the only limits any of us have are the ones we place on ourselves. Of all that she has accomplished, what Muffy is most proud of is her 9 year old daughter, Elle! Motherhood is by far the best of all her adventures!